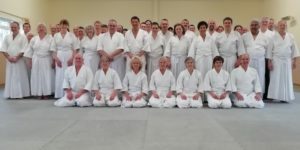 Home » Why do we bow in Aikido? 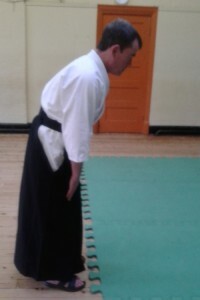 Why do we bow in Aikido? In the West we shake hands as a gesture of friendship (offering the empty sword hand), but remember we also have a tradition of bowing - to an audience, to royalty etc. In Aikido, we are are studying an art that originated in Japan. So naturally, we have inherited the etiquette associated with that tradition, but there is far more to it than that. When we bow in Aikido, we must do so with genuine feeling, and with respect and humility. We must take care not to just go through the motions of bowing and allow it to become a tedious ritual. Firstly, we bow to the mat. It normally takes great effort on the part of the teacher or students to obtain the mat, so we must be careful not to take it for granted. Practice without it could be dangerous, especially for beginners. Secondly, we bow towards the Ki sign. This represents the universe, or nature herself. If we bow with the correct attitude we will remind ourself that we are not above nature, but a small part of something infinitely greater than ourselves. But do not make the mistake of thinking that we are worshipping the Ki sign in any way. Thirdly, we bow to our fellow students and partners, including the teacher. We cannot really study and progress by ourselves, so we should bow with genuine respect and friendship towards our partners. To simplify, to bow in Aikido is a genuine gesture of respect.